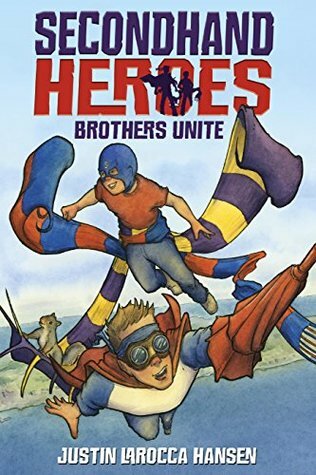 Brothers Unite Summary: Perfect for fans of Amulet, Sidekicks, and Zita the Spacegirl, this graphic novel series debut introduces Stretch and Brella, a pair of ordinary brothers whose extraordinary yard sale discovery turns them into superheroes. Tuck and Hudson are just two average suburban brothers—until their mother buys them a scarf and an umbrella at a yard sale. Quickly, the brothers realize that these ordinary-looking objects are full of magic, and that, with the help of their squirrel sidekick, they can use that magic to fight evil. As the boys move from fighting their neighborhood nemesis to facing bigger foes, they become Stretch and Brella, the unstoppable brother superhero duo. Soon, Stretch and Brella find themselves in another realm, where they take on enormous dragons and an evil knight in an incredible graphic novel adventure. In the Trenches Summary: [Mild Brothers Unite SPOILERS!] Two ordinary objects turned a pair of brothers into superheroes. Now they must fight the evil Trench right in their own neighborhood. 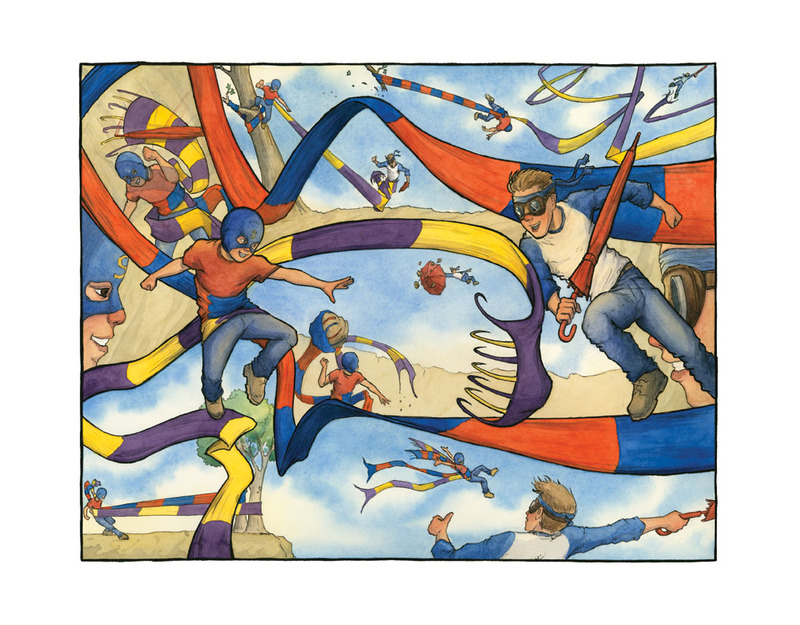 When Tuck and Hudson return from their first adventure as the superheroes Stretch and Brella, they’re still reeling from the shock of their newfound powers. But there’s no time to slow down. Trench, a supervillain whose powers came from the very same garage sale where Tuck and Hudson found their magic scarves and umbrella, lives around the corner—and he’s out to get the brother superhero duo. 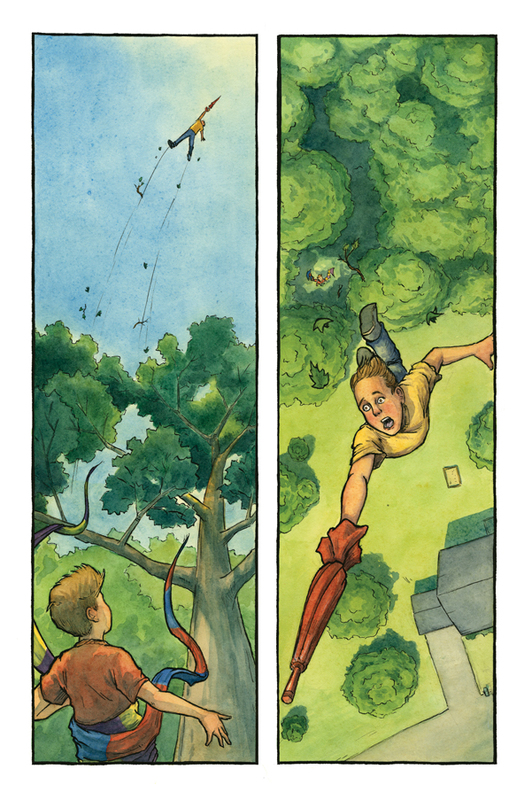 With help from their squirrel companion, Steen, and another newly minted superhero, a neighborhood girl named Elvira, the brothers keep fighting the good fight, with plenty of action and adventure along the way. The Last Battle Summary: [Mild Brothers Unite & In the Trenches SPOILERS!] Two ordinary objects turned a pair of brothers into superheroes. 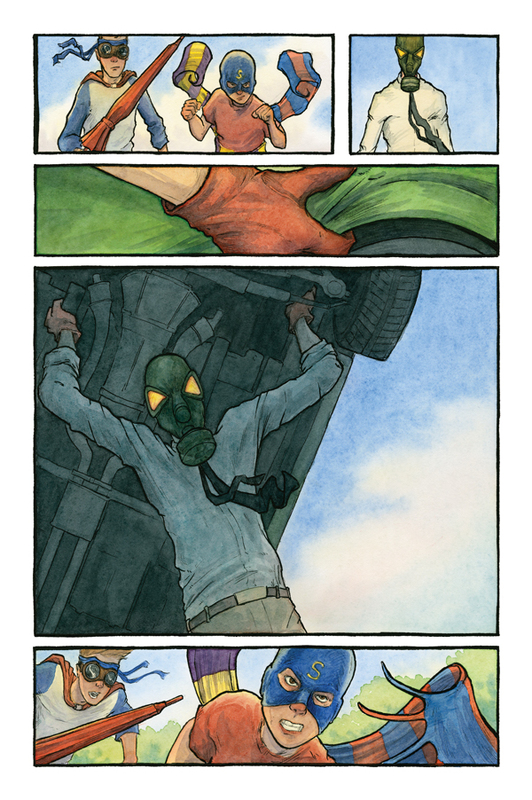 Now they’re banding together with their neighbors to take down the evil Trench once and for all in the final volume of this graphic novel trilogy. Tuck and Hudson have figured out how to wield the superpowers they got when their mom bought them an ordinary-looking pair of scarves and an umbrella at a yard sale. But Trench, their supervillain archnemesis, is only getting more powerful. Slowly, the brothers have discovered the others in their town who have superpowered objects from that same yard sale. Now Tuck and Hudson, along with their friend Elvira and their squirrel sidekick, Steen, are leading a band of heroes in the fight against Trench. This final volume of the graphic novel adventure series features the heroes’ last stand, with plenty of twists and turns along the way. 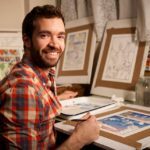 About the Author: [From http://www.justinlaroccahansen.com/] I grew up in the tiny town of Millis Massachusetts but spent most summers in a tinier village called Cataumet in Cape Cod and it is there I feel most at home. 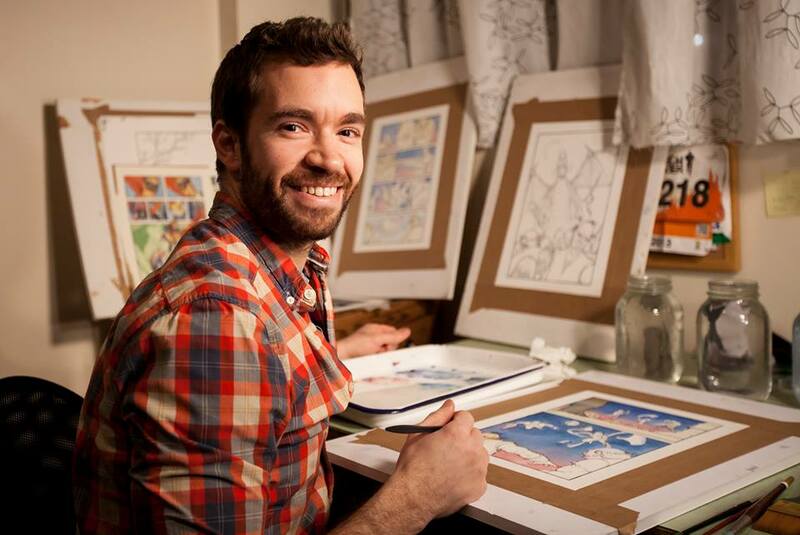 Comic books, cartoons and toys captivated me as a child and I would constantly create my own characters and stories. I went to college at Ringling College of Art and Design where I got a BFA in Illustration. Shortly after I moved to New York City to try and “make it” as an illustrator. It was a long journey with plenty of odd jobs (including a birthday party host and paper airplane teacher), lots of rejections (we’re talkin’ LOTS), and all the ups and downs that come with chasing a dream. I finally sold my first picture book Monster Hunter in 2012 to Sky Pony Press. 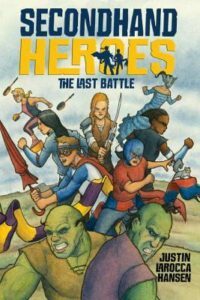 The next few years would be consumed by a graphic novel trilogy that had been kicking around in my head for some time called Secondhand Heroes. The first book of that trilogy, Secondhand Heroes: Brothers Unite was published by Dial Books for Young Readers, an Imprint of Penguin Random House, in 2016. Part two, Secondhand Heroes: In the Trenches came out in 2017 and last summer I finished work on part three, Secondhand Heroes: The Last Battle which will be out on April 10th, 2018. I live in Brooklyn with my most amazing wife and my collection of Springsteen records. Justin is represented by Warner Literary Group. To inquire about commissions, or a school or library visit please use the form at http://www.justinlaroccahansen.com/about/ or email: j.larocca.hansen@gmail.com. 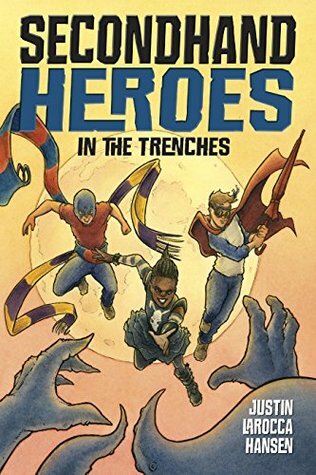 Kellee’s Review: One of my students named Lucas is a huge graphic novel fan, and earlier this school year, he introduced a new series to me: Secondhand Heroes. He had read the first books in the series and wanted BADLY for me to read them and could not wait for the third book in the series. Well he does not need to wait any longer! This is a crazy series! I’ll be honest, in the first book, a twist in the plot happens, and the reader is not sure why, but I promise: TRUST THE AUTHOR! It epically comes together throughout the series. This series is definitely a perfect reading ladder up from younger middle grade series like Zita and Amulet. The bit of romance and realistic violence pushes its age range further into teens which, as a middle school reading teacher, I am always looking for! I also am in love with the artwork. It is different than other series because of its softer undertones and touches which makes it so unique. 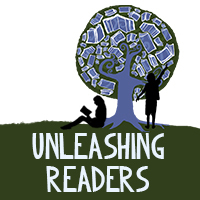 Ricki’s Review: I am so glad that I read this series and have it to recommend to students. While it is definitely above his age range, my son really enjoyed this series. Each night, we read it together, and he imagined that the brothers were him and his younger brother. It’s quite a clever series—the main characters, two brothers, get items from a second-hand shop that prove to be magical. They turn into superheroes. At first, they question whether they should use the superpowers, but they quickly realize how they can use these superpowers for good. I particularly like how the boys slowly discover others in their town who have also gained superpowers. It was fun to read all of the different powers that characters had. The illustrations are eye-catching and engaging. The books in this series were ones that I looked forward to reading each night with my son. I’d put it more at the upper elementary/middle school level and agree with Kellee that these books books make a wonderful ladder for middle schoolers. I’ll be recommending these books often. 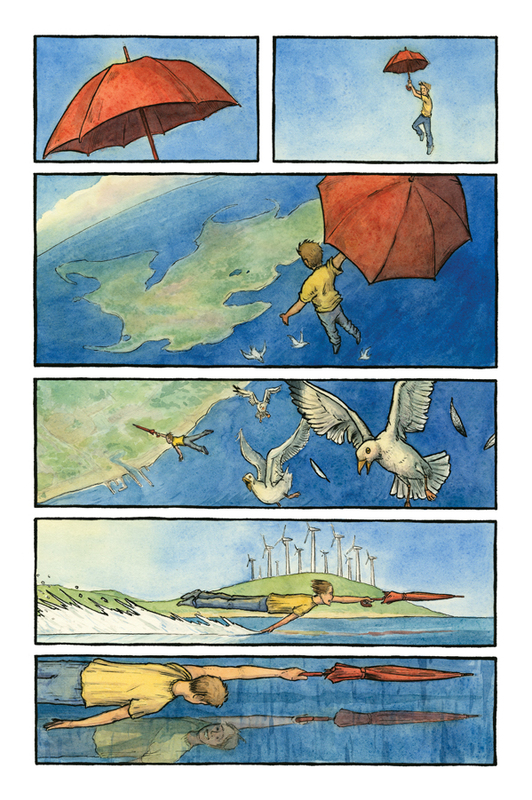 Teachers’ Tools for Navigation: Graphic novels are such an important format to have available for students in school and classroom libraries. “While many teachers are beginning to include [graphic novels] in their classrooms, there are still teachers, administrators, and librarians who struggle with including this format in their schools. So, why should you use them in your classroom and have available for students? • Graphic novels can help with scaffolding when trying to teach higher-order thinking skills or other complex ideas. In the first book, why did the author change settings? How did the boys’ behavior in this new setting affect the end of the series? How did the superpowers bring the brothers together? How did Brella’s interest in Isabella cause him to struggle with being a superhero? How did Trench use Brella and Stretch’s “weaknesses” as a good person filled with love to manipulate them? How did Trench set up Brella and Stretch? How would you compare/contrast the boys’ character traits from the first book to the last book?